The vertical vent kit contains all the basic components required to vent a 4 inch tankless water heater through a roof. In most cases, additional Z-Vent pipe lengths will need to be purchased and are available on homedepot.ca. Back-flow preventer is included for cold climates. The Eccotemp EL22i Liquid Propane Tankless Water Heater is the largest indoor model of the Eccotemp tankless line. It features a sleek, black tempered glass casing with automatic temperature controls and a touch screen with an LED digital display that shows the output temperature reading and GPM flow rate. The EL22i is rated at an impressive 6.8 gallons per minute and has a maximum BTU rate of 140,000. Powered by liquid propane, the EL22i is the perfect solution for all the hot-water needs of a standard home or apartment with one or two bathrooms, as well as smaller commercial applications.IMPORTANT NOTE: Not recommended for elevation above 3,000 ft and cannot be used for HYDRONIC SYSTEMS, RECIRCULATING or FLOOR HEATING.Includes Z-Vent 4-inch. Horizontal Vent Kit (exhausts through wall). The Eccotemp EL22i Natural Gas Tankless Water Heater is the largest indoor model of the Eccotemp tankless line. It features a sleek, black tempered glass casing with automatic temperature controls and a touch screen with an LED digital display that shows the output temperature reading and GPM flow rate. The EL22i is rated at an impressive 6.8 gallons per minute and has a maximum BTU rate of 140,000. Powered by natural gas, the EL22i is the perfect solution for all the hot-water needs of a standard home or apartment with one or two bathrooms, as well as smaller commercial applications.Includes Z-Vent 4-inch. Vertical Vent Kit (exhausts through roof). This Stainless Steel 3 in. x 5 in. Concentric Direct Vent Termination Kit is designed for use with Rheem EcoSense Mid Efficiency Tankless gas indoor direct vent Units. Made of durable stainless steel, the kit includes the components required to construct a typical through-the-wall venting with horizontal termination. 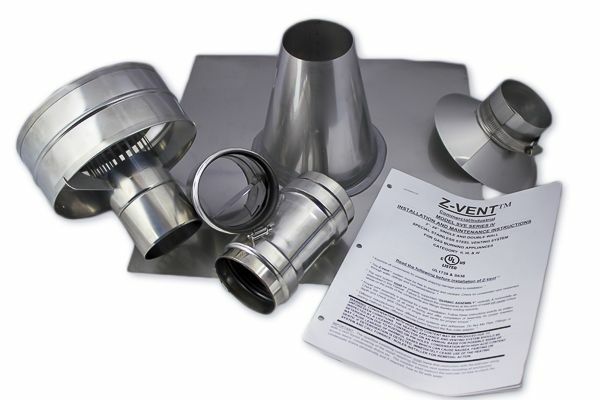 Z-Vent 4 inch Vertical Vent Kit The vertical vent kit contains all the basic components required to vent a 4 inch tankless water heater through a roof. In most cases, additional Z-Vent pipe lengths will need to be purchased and are available on homedepot.ca. Back-flow preventer is included for cold climates. Z-Vent 4 inch Vertical Vent Kit is rated 1.0 out of 5 by 1.